As part of our mission, the members of Co. A, 3rd Maine are happy to provide educational presentations for schools, historical societies, and other groups. 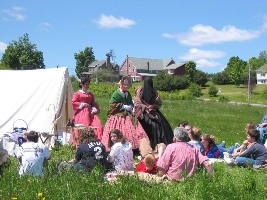 Unlike our living history encampment events or battle reenactments, these usually involve a small number of unit members in a more intimate setting. 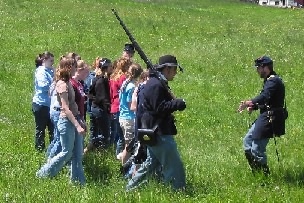 We have experience in discussing the Civil War, its people, and Maine's involvement with individual classes of students as well as entire schools in day-long programs. We encourage teachers and historical society members to contact us and inquire about our educational programs. Depending upon your needs and interests, we can provide presentations that address the lives of soldiers, the roles played by women, the music of the Civil War era, and other specific topics such as medical care, the United States Sanitary Commission, weapons used in the 1860s, etc. We offer these programs free of charge, although donations to our organization are always welcome. Because most of our members are gainfully employed in 21st century jobs and because our schedule tends to become full, especially from April though September, we ask that schools and groups wishing to make use of our services contact us several weeks in advance of the dates that fit your needs. It is best to contact us before we vote on our yearly calendar of activities in January. We can not always honor requests received after our calendar has been set. We ask that teachers wishing to invite us into their schools complete and mail the presentation request form provided below. Please include "Third Maine Educational Outreach" in the subject line. Teachers, download a presentation request form here (PDF). Please make requests no later than two months prior to the desired presentation date.